Pimple-the privilege in the young? Many people use the words pimples and acnes interchangeably. In fact, acne is a specific medical category. What most people call pimples is actually referring to the condition acne vulgaris (vulgaris means common). Although acne is commonly seen in adolescences, it can occur from baby to elderly. Increased oil gland secretion, growth of bacteria in the hair follicle, obstruction of the follicle, and inflammation are the four recognized contributing factors for the development of acne. 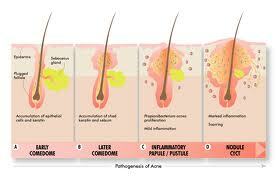 As the oil gland secretion is very active in adolescences, it explains why acne is predominant in this age group. When acne is found in the very young and the very old, other underlying medical causes should be looked for. Acne develops in stages. Comedones, people call it black heads is the earliest stage, followed by red bulbs and pustules. On the contrary to the common myth, acne has nothing to do with dirt. The black color of pimple is due to oxidation of the skin cell debris materials obstructing the pore of the follicle. When these substances are formed deeper in the duct, only fleshy bulbs are seen on the face, and we call it “white heads”.